As I understand the Japanese scoring, making seki is worth 8 points for Black here and killing the white group is worth 30 (plus two for each attached stone - so 38 in my case, I think). I don't know if this is of interest to anyone, but, whatever happens here, White must prevent Black from forming this shape. If he manages it, he's got one eye, and all the circles are shared liberties with White... and White has no other liberties than the circles. So, immediately Black plays at one point, White must play at the other. Bill: Actually, if Black plays at one of those points, White dies. I think you can get seki or ko. If Black plays at a, White plays b and White has an ugly ko on her hands. 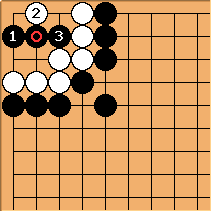 If Black plays elsewhere, White plays b and you have seki. HolIgor: And if White does not play b? Black will have to play b anyway to kill; which brings about more favourable ko. unkx80: If Black plays at a, White should not play b and leave it as a ten thousand year ko, I think. OK... but was an endgame play. What happens when the game is already "over ten thousand years old", so to speak? Suppose there are no other meaningful plays on the board. 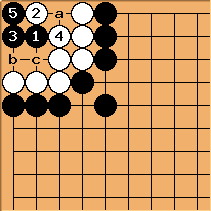 If Black plays as shown, White must pass (or throw away a stone), fill at a, or take away a shared liberty at b or c. Filling results in death; Black can make a dead pyramid four shape at b. Taking away a liberty also is deadly; Black takes the ko, White cannot retake (no meaningful ko threats) or fill the other shared liberty (shortage of liberties); and Black captures. So White passes. If Black passes, the game is over and I think the players must agree it's seki, since obviously neither wants to touch the situation. If Black fills b or c, White captures and is alive. So Black takes the ko. If White takes a shared liberty, Black connects the ko and White is almost filled with a bulky five and dies. Here White passes at and . at the circled point was captured. 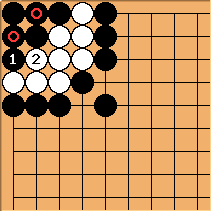 After capturing, the circled points are miai for White to divide the space, and Black won't be able to capture inside because of shortage of liberties. If Black passes here (after he takes the ko and White passes) they again have to agree it's seki. 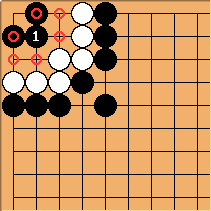 If Black tries filling a shared liberty, White can take back the ko and Black eventually dies. judynogo? : Why seki? Black passes, White passes, they dispute, then who goes first to prove it? 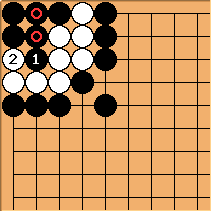 The idea is that neither player wants to go - you work backwards from a more obvious seki. Something like that. To try explaining it another way: having won the ko, neither player can benefit from connecting the ko; and having won the ko, neither player can benefit from filling one of the other liberties. Overall conclusion: With no ko threats elsewhere on the board, the whole thing is definitely seki after best play by both players. I got one out of two moves right, and my mistake only cost 30 points instead of 38. Bill: If Black plays first, optimal alternating play leads to a 10,000 year ko, which normally favors Black (since he has less to lose). This position occurs in Murashima Yoshinori's Ko Dictionary. It was analyzed in ''Generalized Thermography'' by Martin Mueller, Elwyn Berlekamp, and myself. It is hyperactive. has a miai value of 7. This will become seki. In the neutral threat environment this is also orthodox play. has a miai value of 9 1/8, and White a (or Black a) has a miai value of 8 3/4. The neutral situation is closer to that when Black is komaster than when White is.